A battle remembered by a race? Or was it the single most important battle in Western Civilization? Terms from military history have entered the English language in many ways, but primarily fairly literal ones. If we say someone “met his Waterloo” we know it means a final defeat. But one battle’s name means a far broader range of things, most of which have little to do with actual battle. But originally the word was the name of a small Greek village and applied to the plain nearby — a plain noteworthy for being a good place where hundreds of Persian ships could offload thousands of Persian troops and let them get organized, before proceeding the distance to Athens and burning the city in revenge for the Athenians supporting a rebellion against Darius I. It was a place where, oddly enough, two armies confronted each other for FIVE days with almost no fighting, and Athenian democracy was put to the test as the Greek forces debated (and voted) whether or not to attack the Persians, finally reaching the affirmative only after seeing most of the Persian cavalry reloaded onto ships for use…somewhere probably unpleasant for Athens. 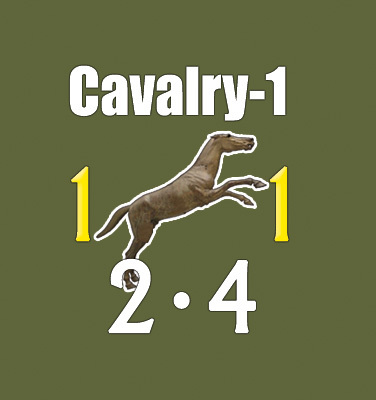 As to the battle itself, numbers are uncertain but we know the Greeks were heavily outnumbered. We know also that the two armies’ fighting style and equipment were near opposites, with Greeks depending on shields, armor, and close-quarter fighting and Persians depending on missile weapons and skirmishing. It seems pretty clear that the Greek army ran (or advanced at speed) as soon as they got within bow range, to reduce the time they would endure arrows without being able to retaliate. And it seems pretty clear that, once the Greek army closed with the Persians (who had no room to withdraw and maintain a firing distance) that the battle would be a slaughter. It was. After the battle, the Greeks knew Athens was still at risk, either from ship-born Persian forces or from traitors, a key Persian tactic having been buying support from local citizens. 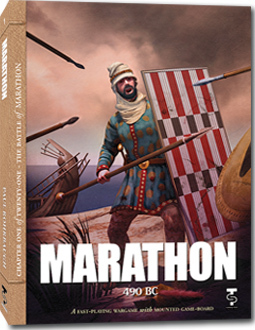 The Athenians at Marathon represented the city states’ only army and the city itself was vulnerable to attack or betrayal… and false reports of the army being destroyed would make capitulation the most logical response to a Persian force demanding surrender. Thus the urgency of getting news back to the city as quickly as possible. But the greater urgency of getting actual troops. We forget that horses were not much of a Greek tradition at this time and that what small animals they did have could not carry a man for long. Thus the habit of long-distance runners as messengers. It is true that a runner (possibly called Pheidippides) had run as messenger to Sparta and back, before the Greeks left for Marathon. After the battle, the main body of Greek troops staged a quick march back to the city. Somehow the two stories were blended and popular legend has Pheidippides running back to Athens, to cry out “Victory” and then die. It makes a nice story, and 26 miles makes a better race than the 140 miles actually run to Sparta. 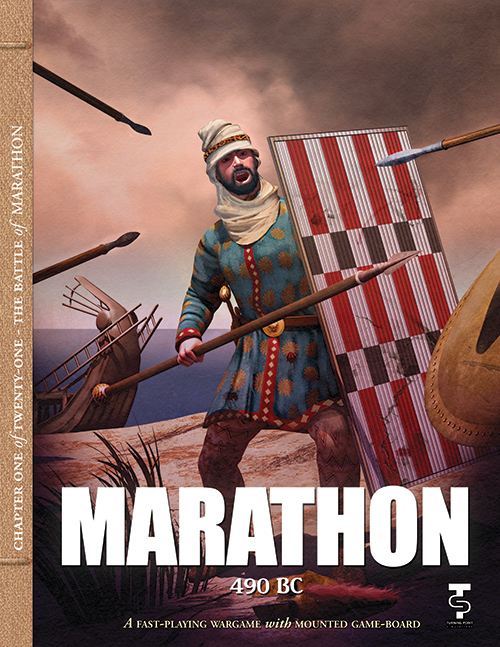 At under two hours of play time, you can make your own explorations into this battle without scheduling “marathon game sessions” in order to play. With a mounted, full color 11” x 17” map and just over 175 unit counters, you’ll be able to try various strategies and see what differences you can make on the outcome. 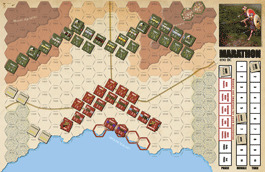 Units activate by chit-pull per formations and combat includes both melee and ranged fire. Leadership and morale matter (in several ways) and combat results use step reduction and several levels of unit deterioration. The game offers a historical set-up scenario plus variants for both set up and reinforcements. With the variants, it’s possible that the Spartans may finally show up to the battle! About the Designer: Paul Rohrbaugh lives and works in Youngstown and the Mahoning Valley, Ohio. He has been a teacher for Teacher Corps, taught 7th and 8th grade history, served as a librarian, professor of education at YSU, as well as game designer and author. He’s also served as developer of several games published in Against the Odds Magazine. Paul earned Bachelor and Masters degrees in history, as well as Master degrees in education and library science from YSU and KSU. He’s also been awarded two Charles S. Roberts Awards for games he’s designed or developed for ATO. In 2011 Paul debuted as a game publisher with his line High Flying Dice Games.